Welcome to David Llewellyn’s website. As one of the highest qualified golf professionals and coaches in Europe, with over 40 years experience, David is able to help you improve your game or help you get started! Based at the Vale Resort in South Wales, David's uncomplicated coaching methods can lower your score and help you develop all aspects of your play - from swing technique, short game, distance control, course management and most important of all, mental focus. His comprehensive and flexible coaching programmes are designed to suit golfers of all levels. He can work with you individually or why not combine your sessions with friends? You can also take advantage of the half and full day golf schools or treat yourself to a holiday in the sun for a week of coaching and competition. 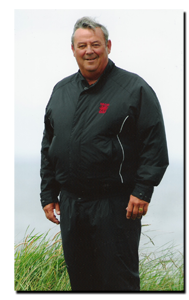 David has also hosted company golf days and clinics for over 30 years. He can make your day unique with his knowledge and experience of playing with the world’s best players. David’s Executive Company Golf Coaching is an ideal way to reach your clients and customers. In 2012, David was made an Honorary Member of the Professional Golfers Association. To become a better golfer, contact David.